They all offer higher than 4K resolution in raw with a S35 sized sensor (although…. RED Raven barely barely squeaks in here as an option, because its max 4.5K option is only possible when shooting wide. Doing standard 16:9 and it drops down to “merely” 4K resolution, and its crop factor then ends up being closer to a Panasonic GH2 than a S35 camera! But you’re stuck with the awkward Canon EF mount with no way to speedbooster it to get a wider field of view from your lenses). The Kinefinity Terra 6K has an impressive listing of specs, putting its features at near to RED Scarlet-W territory. And uses the proven Kinefinity 6K sensor which we’ve seen before with the KineMAX 6K can produce nice imagery, so hopes are high with the Terra 6K (the cheaper Terra 5K however uses a new 5K sensor which we’ve never seen anything from before). So which of the top 3 low budget cameras with higher than 4K raw options would I likely prefer? And so I’d be left with a tight contest between UM46 or Terra 6K (cost is basically the same more or less, and arguably the support with Kinefinity isn’t “too much” worse than BMD?? Depends on your location in the world, and how much of a language barrier you’d experience personally with Chinese). I’m feeling like leaning towards the Kinefinity Terra 6K! Colours of Culture Bali (by KineMAX) from Kinefinity on Vimeo. Looking at that it would seem either the body only with the KineBACK + KineGRIP (about US$1.5K extra), or the Terra Pro Pack are the most interesting options (as I reckon a KineBACK is pretty close to essential to have as an option for professional shooting, and the KineGRIP is just so nifty to have if you want to slim down the Terra to merely DSLR size). Then kit out the rest of what is needed from your existing gear collection. If you need extra batteries they’re cheap (as the power draw of a Terra is less than half of a RED Raven or UM46, and BP-U batteries or V mount can be sourced cheaply from eBay), and media is cheap too (as you can use off the shelf SSDs if they’re fast enough, you don’t need pricey MINI-MAGs from RED or CFast cards). Previous PostSet of camera gear for a school to use for teaching filmmaking to young teenage students? 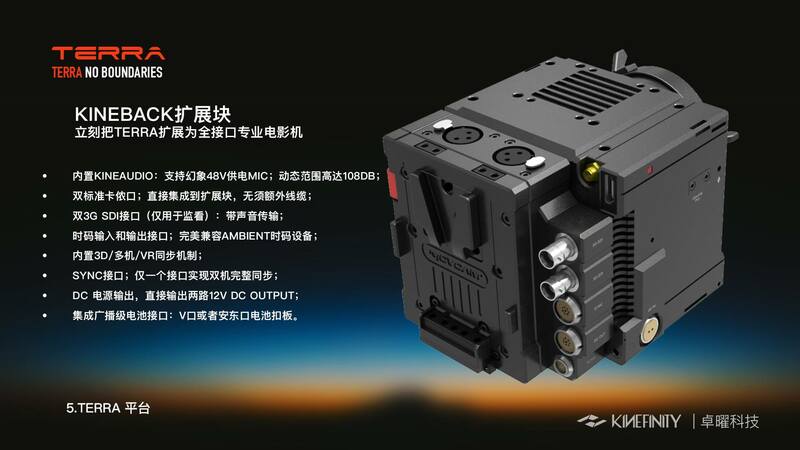 Next PostWhat if Kinefinity’s KineMount became a universal cinema mount? For me it’s the ergonomics/lowlight/maybe color workflow of the Ursa Mini 4.6K vs the cheaper media/more modular/higher frame rates of the Terra. Is it only the 5K version that has the global shutter option? it is a personal preference, but I’d argue the ergonomics would be better with the Terra than the URSA Mini. As you can always rig up a small camera but you can’t strip down a large camera (as although the the URSA Mini has the name “mini” in it, this is a much bigger camera than the Terra!). Being able to configure the Terra in a similar size and shape to a DSLR is a really nice feature! I like also that a Terra wouldn’t be as top heavy as a RED would be. Base ISO is rated the same on a Terra and URSA Mini 4.6K, though we’d need to see head to head testing to be sure. But the Terra has the option to use a focal reducer, which will *double* the amount of light you’ll let in. Thus I wonder and suspect if maybe the Terra will have the lowlight edge over the URSA Mini 4.6K? There are a few other benefits of the Terra which you left out as well, like the obvious higher resolution, but also number of other interesting facts like WiFi and lower power consumer (much lower! About half, or less). Barring the loss in ergonomics, you can use SSDs on the URSA Mini with the Atoch/C-Box thing. But I see the C-Box alternatives as not really a “cheaper alternative”, as CFast cards are dropping fast in price while a C-Box itself is kinda pricey, instead it is an alternative which allows you to go *bigger* for longer/raw, in exchange for a small trade off with ergonomics/risk. Because the price of C-Box with a single SSD is similar (or even higher!) to the price of a starting pair of CFast cards. The approximate price of the C-Box ‘solutions’ is $600. This allows an operator to use, say, a 512GB Samsung Evo 850 Pro SSD. 2ea 512 SSD’s at $428 (total) + C-Box $600 = $1028 for just over a terrabyte. 1TB for CFast is $2959.92 (8 128gb Sandisk). The price of CFast cards has come down marginally. As in, a price point that doesn’t make that much difference. People in the ‘industry’ keep saying the price of CFast has come down/will come down soon. I’ve heard this same song and dance for three years straight now. It’s not happening. Bottom line, if you’re going to be doing a lot of shooting with your Ursa Mini you need to seriously consider the investment of the C-Box. For the same price as a CBox set up you can get enough CFast cards for a day’s shoot with ProRes. Or raw if you’ve got an on to it DIT to offload. Thus my point, I think the CBox alternative is interesting but in my view only a fairly niche of a niche item in terms of its usefulness. Plus CFast will be usable for many other things going into the future, and thus far more versatile than the CBox which you might very well buy now but then chuck away in a couple of years from now. And CFast *is* getting cheaper, we’re seeing that happen with our own eyes. And as it becomes more and more mainstream (once more DSLRs are using it) then it will drop even faster in price. People are already buying 128GB cards for under US$150. That is so cheap! I paid more for my SD cards for my BMPCC. And BMCC owners paid more for their SSDs when they came out. Respectfully, David, people lining up and shelling out the dough for the Ursa Mini or Terra DON’T have the budget for an extra grand or a DIT. And yes, they will be shooting raw all day (until they run out of HDD space at home then switch to Prores, lol), or PRHQ all day. It doesn’t matter if you have a production that demands it or not. People grabbing these cameras are going to make sure their media cards are ready, batteries charged and they’re out the door all day shooting whatever, just to get familiar with the camera. Besides that, I shot a wedding (morning broll, getting ready, ceremony, photoshoot after ceremony, two hour reception, 23 individual interviews of family and guests) at 1080p with Proress 422 in the BMCC and went home with 1.2TB. Most of that footage was relevant and made it into the 2.5hr DVD set. So yes, there are productions that will demand volumes of media. We’re arguing too many points so lets strip it all down. Somebody without a studio behind them, somebody that isn’t funded or sponsored, somebody that doesn’t have clients, somebody like a regular lower-middle class guy doesn’t have the money to be throwing around. Between the Raven, Ursa Mini and Terra I believe the Terra is the best economic choice out of the three. Out of the three, media for the Terra will be cheapest. And I believe, out of the three, Terra will have the best looking images. People that CAN afford a Raven? Shut up and go buy it and have fun with all your compression rates and Prores options. I hate you a little bit because I’m jealous. People looking at the Ursa Mini and making room in their bank account to buy it? STOP! Don’t do that! Buy the Terra instead. It’s easy and inexpensive to make an ‘SSDs connected system’ to the URSA mini yourself. The Atock/C-Box is way over priced. Good comparison but it wouldn’t be complete without mentioning compression details across these marvel cams! Regarding Raven vs URSA mini 4.6k: the URSA mini 4.6k gives you three flavours or RAW in full 4608×2592 and ProRes in max 3840 x 2160 resolution (not limited to HD like on the Sony F-series with ProRes option) whereas the Raven is 3:1 REDCODE for 4.5K 2.1:1 (4608 × 2160) at 24 fps then dropping to 8:1 REDCODE for 4.5K 2.1:1 (4608 × 2160) at 60 fps. :s Nice one RED. As for Kinefinitiy, well to be honest I’m not sure what their compression ratio is for the 5K Terra maxing out at 60p, and 6K Terra maxing out at 25p. True true Dennis, I could’ve gone into more detail about the recording options. Lots more still to go into details! 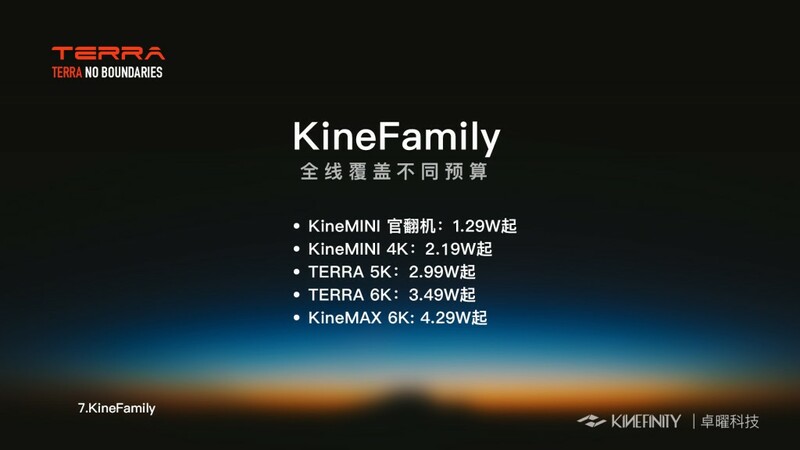 I hope to soon put up a new article with the translations from Chinese of all the slides Kinefinity used at their announcement. Which will go into greater detail. And if you want to do slow motion with a Raven, such as 120fps 4K, then you’re suffering a suffocating 13:1 compression!! 😮 Think I’ll likely prefer skipping that, and settling for Kinefinity’s 100fps in full KineRaw instead (as that is the format which the KineMAX 6K uses, and I’d be inclined to assume Terra 6K will be the same). Very good info, and I agree the Kine cams are worth taking a second look at. I own Kinemax from Kinefinity and the images are stunning. The camera is well built and I’m using a simple SanDisk drive to capture even slow motion at 75 fps at full raw. I get full frame focal length with my small leica r primes. For travel work I will upgrade to terra to keep the system even smaller. You can do a lot more with a lightweight compact camera in terms of motion. The only thing I wish for is for Final Cut or Davinci to support krw files natively instead of having to transcode.